We asked house music legend Olav Basoski: How do you create those awesome sounds on your dance tracks? 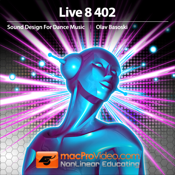 Instead of answering with a text message, Olav produced this incredible Ableton Live tutorial called Designing Sound for Dance Music! In this specialized set of videos, Olav starts out with a basic dance synthesizer lesson explaining how fundamental synth concepts like analog, FM and function envelopes are extrapolated into the fabric of House Music. From there he shows off his incredible Ableton Live chops by taking us drum-by-drum, sound designing the dance kit and showing us the techniques he uses to recreate a rhythm section that destroys the dance floor. Next, Olav does a deep dive into pads, synth leads, arpeggiators and bass synthesis, demonstrating in his fun and knowledgeable way how he is the de facto master of audio production in the dance music universe. So if you want to know the sonic secrets behind Olav’s house mega-hits, plug into this Ableton Live tutorial and you’ll soon be Designing Sounds for Dance Music better than anyone else you know ... that is except the master himself: Olav Basoski!